4. You're done! Your items are on their way. Payment will be taken each week automatically. Showerdome® Shower Top is available in many different shapes and sizes which accommodate most new and existing showers. All prices are the same regardless of the size of your shower. A local installer will be in touch within 24 hours to make arrangements & confirm pricing. Our standard installation rate is $150 incl GST, however this may vary depending on where you live, or if you have special requirements. Buy online now and we'll ship your order within 24 hours, complete with our DIY install guide (click to download). Request a quote from your local Showerdome installer. Buy online now with no installation cost. Buy online now and we'll ship your order within 24 hours. Buy online now, measure up later. Is your shower contained within 3 built walls? Stand INSIDE the shower cubicle. Place your tape measure in the middle back corner. Measure from the corner to the inside of the framework on each side. 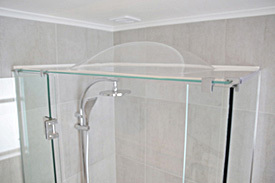 The shower has a thin metal frame across the top of the glass walls. The shower has no metal frame across the top of the glass walls. A local installer will be in touch within 24 hours to confirm installation pricing and make arrangements. Copy the code in orange into the box below. Once you're done just press the "Send order" button to proceed. Pricing excludes installation. Standard installation is $150 incl GST. This rate may vary depending on location & install requirements. Accepted file types: jpg, png, bmp, jpeg, gif, doc, docx, pdf. If you can't supply measurements right now, you can buy online and measure later. We'll ship your order once you have provided us with the required information.